ON THE GO OC - Things to do with your family. : Queen Mary's CHILL Brings New International Holiday Experiences Plus Discount Code! Embark on an international holiday expedition this winter as the world-famous Queen Mary introduces an all-new CHILL unveiling December 13, 2017 through January 7, 2018. Featuring the first-ever Ice Adventure Park in the U.S., the newly-inspired CHILL offers a rush of family fun celebrating holiday traditions from around the world. 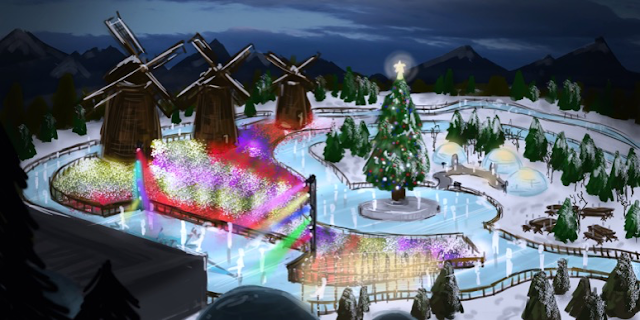 The 38,000-square foot ice park will offer an ice skating track, ice bumper cars, ice tricycles, a zip line, ice shuffleboard, a two story - 100-foot-long ice tubing slide and many more festive winter activities. Visit CHILL for an icy expedition honoring international holiday traditions and the cultural celebrations of Germany, Switzerland, China, Russia, Holland, and the North Pole. Start the CHILL holiday adventure in Germany and experience the famous Munich Market and Gnome’s Wishing Well, then ice skate over to Switzerland to cozy up in the Alpine Lodge with Swiss holiday treats including chocolate and cheese. Enjoy a festive Chinese celebration with weekly fireworks, the traditional Lion Dances, Shanghai Speedway, and even Chinese Lantern decorating. Explore Russia’s holiday season with vodka sips in the 9-degree Ice Bar, or dance the night away under the Northern Lights Show as DJs spin the coolest tunes. Twirl around Holland’s outdoor ice skating village with live shows, private chalets, and Windmill Way featuring gourmet donuts and pancakes at the Dutch Pantry. Complete the CHILL adventure with a visit to the North Pole for some ha-ha-has and ho-ho-hos at the Claus Cabin, build your own stocking with Santa’s elves, and get in the ‘holiday spirit’ with liquid-candy at the Candy Bar. CHILL offers family fun for all ages and an array of exciting activities with the new 38,000-square foot Ice Adventure Park, the first of its kind in the U.S. Barrel down CHILL’s famous 100ft Matterhorn Mountain ice tubing slide, take a spin on the ice track with the ice bumper cars and ice tricycles. Thrill seekers can get a bird’s eye view of the entire park on the Alpine Zip Line, soaring 34-feet above the ground and for over 300 feet long! Challenge your friends and family to ice shuffleboard, enjoy DJs spinning nightly and much more. The all-new CHILL offers an opportunity to experience international cuisine. Tempt your taste buds with beverages and bites from around the globe including Germany’s Twisted Pretzel and Tasting Tavern and the Brat Haus. Pay tribute to Swiss delicacies with a visit to the Zurich Deli, the Fondue Pot, and the Alpine Lodge’s restaurant: Chateau Bar. Sip on traditional teas in China’s Zen Teahouse and the Hot Pot. Then warm up in Russia at CHILL’s Pierogi Paradise or the Stroganoff and Stew Pot. Curb your sweet tooth with gourmet donuts, make-your-own Gingerbread house or visit the Fire Pit to roast marshmallows and make holiday s‘mores." Wow we have loved CHILL ever year thus far but I am so excited to bring some International traditions into the Holiday mix for my family. We love to explore traditions of all cultures! Looking forward to each and every bit of this and I'm glad CHILL kept the stocking making...that is a family favorite! CHILL pricing starts at $29.99 for adults and $19.99 for kids (ages 4-11). In celebration of CHILL’s return, Queen Mary is offering a special 48 hour sale of 50% off select dates for General Expedition tickets by using promo code ELF50 when purchasing tickets at Queenmary.com. The sale will run midnight September 20 through 11:59 p.m. on September 21. VIP Ultimate Expedition tickets and ELF Passes (fast passes) are also available.